Henry Ford was an absolute titan of industry. His ability to mass-produce the automobile made them affordable to the average citizen in the United States. Owning cars revolutionized the way people lived. On more than one occasion, Ford attempted to do the same thing with the airplane—create a simple, affordable, and easy-to-fly aircraft for the masses. The design of an inexpensive and mass-produced aircraft was referred to as a “flivver” plane. The Ford Motor Company’s last flivver aircraft was the 15P, and like previous attempts, it did not succeed. Full-scale mockup of the Ford 15P from January 1935. With the exception of an unfaired tailwheel, the complete aircraft was very similar to the mockup. Edsel Ford, Henry’s son, had an interested in aviation, and he helped finance William B. Stout’s founding of the Stout Metal Airplane Company in 1922. By 1924, Henry had joined Edsel to help the Stout Metal Airplane Company, and the Ford Motor Company (FMC) built an airport and factory for Stout in Dearborn, Michigan. In 1925, the FMC purchased Stout’s company, which became the Stout Metal Airplane Division of the Ford Motor Company. The Stout Division went on to create the famous Ford Tri-Motor transports. The Great Depression had a large impact on the FMC and Stout Division. By 1932, Henry Ford had refocused his efforts on automobiles; aircraft production and development at FMC had virtually stopped. In November 1933, the Aeronautics Branch of the Department of Commerce challenged the aviation industry to develop an $800 aircraft that just about anyone could afford, fly, and maintain. This concept—a Model T of the air—mirrored that of Ford’s flivver plane attempts. In early 1934, FMC had experimented with a flathead V-8 modified for aircraft use. Coinciding with this engine’s development was the design of the 15P aircraft by Harry Karcher and Gar Evans. A model of the 15P was built in September 1934, and a full-scale mockup was completed in January 1935. It is not clear if the main proponent of the 15P was Henry, who had a long-standing quest to make aircraft ownership possible for the average citizen, or Edsel, who had always been interested in aviation. In all likelihood, they probably both had an equal role. 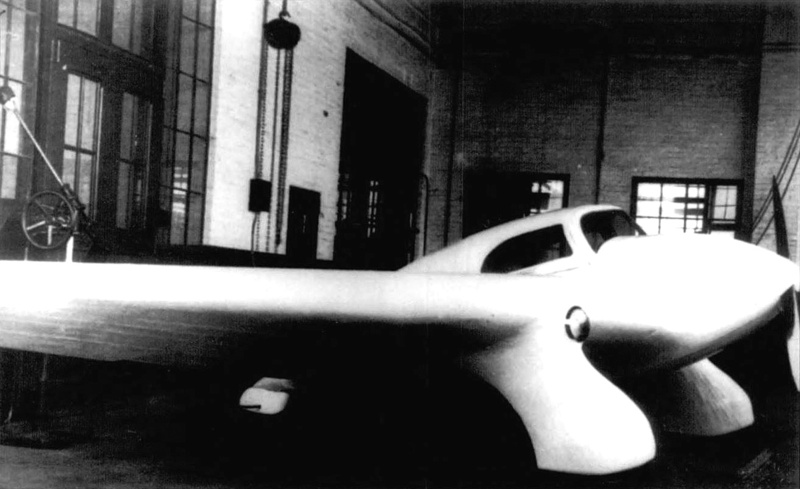 Regardless, construction of the 15P followed the mockup, and the aircraft was completed by early 1936. The Ford 15P was a tailless, flying wing aircraft with the pilot and single passenger sitting side-by-side in a teardrop-shaped fuselage. The cockpit had dual controls and instrumentation in the center, making the aircraft easy to fly from either seat. Each seat in the cockpit was accessible by a hinged top hatch that opened up toward the center of the aircraft and a hinged side window that opened toward the front of the aircraft. The fuselage was made of steel tubing and covered with aluminum sheeting. The wings had an aluminum structure, were fabric-covered, and each carried 15 gallons (57 L) of fuel. Along the wing’s trailing edge, flaps were positioned near the fuselage. Outboard of the flaps were drag rudders, and elevons (combination elevator and aileron) were at the wingtips. The 15P was supported on the ground by standard taildragger landing gear. The main gear was positioned under the wings and enclosed in large, streamlined fairings, which also housed a landing light. The castoring tailwheel was positioned at the extreme rear of the aircraft. 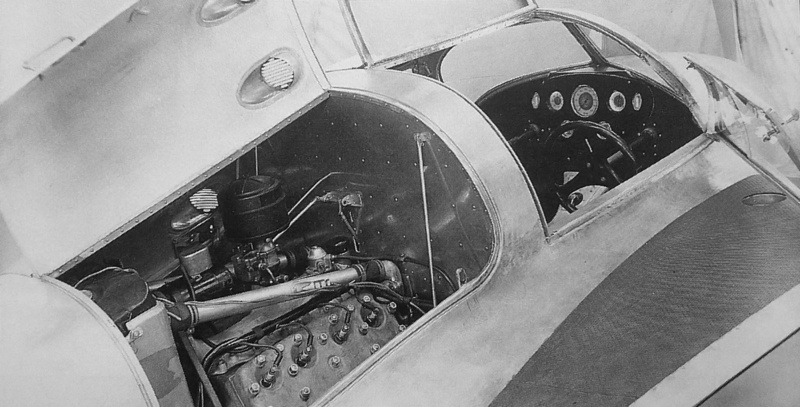 Directly aft of the firewall behind the pilot and passenger was the Ford flathead V-8 engine. Although engine specifics have not been found, the engine most likely had a 3.0625 in (77.8 mm) bore, a 3.75 in (95.3 mm) stroke, and displaced 221 cu in (3.62 L). The engine is noted as being virtually standard so that parts would be available from most Ford auto repair shops. Unique to the aircraft engine was its all-aluminum construction and that it produced 115 hp (86 kW) at 4,000 rpm. The engine drove an enclosed propeller shaft that ran between the pilot and passenger. Sources list the 15P as using a 6.5 ft (1.98 m) diameter, wooden Gardner propeller. However, photos appear to show a metal propeller. The engine cowling consisted of two panels that hinged up toward the center of the aircraft. Each panel had two air scoops, and another scoop was positioned between the panels on the aircraft’s spine. The radiator was positioned aft of the engine, and three rows of louvers were behind the radiator. Cooling air would enter the engine compartment via the five scoops and through an additional scoop positioned under the aircraft. Air would pass through the radiator and exit via the louvers at the rear of the aircraft. Some sources state the radiator was retractable and could extend below the aircraft; however, this would have added much complexity to what was supposed to be a simple aircraft. Instead, perhaps the ventral scoop could be extended to allow more airflow during ground running. The engine’s exhaust was expelled under the aircraft. Very little information regarding the Ford 15P remains. The aircraft’s approximate specifications are a wingspan of 34 ft (10.4 m), a length of 14 ft (4.27 m), and a gross weight of 1,600 lb (726 kg). The 15P had an estimated top speed of 120 mph (193 km/h) and a maximum range of 500 miles (805 km). The Department of Commerce assigned registration number X999E to the 15P on 29 November 1935. The date of the aircraft’s first flight has not been found. Reportedly, the 15P made several flights, all made by FMC’s head pilot, Harry Russell. Controlling the aircraft was problematic and an issue that was not solved before the plane was damaged in a landing accident. The damaged 15P was placed in storage and not repaired. FMC ceased aircraft operations, closing the Stout Metal Airplane Division in 1936. Apparently, what remained of the 15P was stored until 1941 when Henry Ford requested that it be used as a basis for an autogyro-type aircraft. Ultimately, the autogyro aircraft never flew, and its design was deemed unworkable. Whatever was left of the 15P disappeared along with the autogyro. This entry was posted in Aircraft, Between the Wars on 10 April 2016 by William Pearce. Fascinating story – I had no idea that Ford had built a low-course general aircraft. Shame that it didn’t make it to production – it was a very aerodynamic looking aircraft. I’m glad you liked the article. Ford made a few attempts at a general aviation aircraft. There were four one-place “Flivver” planes; all were very similar to each other but also incorporated many changes. Ford also built a two-seat amphibian. Of course, only the Tri-Motors were successful.